Because of their solid state design, low power requirement, high efficiency and durable construction, LEDs offer a wide range of improvements over traditional light sources. Able to produce light in specific wavelengths, containing no gases, filaments or glass, and much smaller than traditional light sources, LEDs are a radically different way to produce light and as such, have much different properties than the traditional light bulb. LEDs are solid state devices designed to emit light energy when an electrical current is applied to them. Similar to the diodes found in most modern electronics, LEDs are comprised of a small piece of layered semi-conducting material which is then coated or impregnated with specific materials to create a specific type of path, also known as a p-n junction represented by an anode and a cathode, to create a one way flow of electrical current. When electricity is applied to this p-n junction, negative electrons collide with positive electrons which absorb them. Since the electron now has too much energy and has become unstable, it must shed some of the energy to regain stability. The energy shed from the electron is in the form of photons, or, visible light. The wavelength at which light energy is released is determined by the type of semi-conducting materials and the nature of the material used to coat or impregnate the semi-conductor. By altering the type of materials used, LED manufacturers can alter the type of light the LED produces. In this way, LEDs can be designed to produce light in a specific color or light wavelength such as red, green blue or even the infrared end of the light spectrum. Because of their solid state design, low power requirement, high efficiency and durable construction, LEDs offer a wide range of improvements over traditional light sources. Able to produce light in specific wavelengths, containing no gases, filaments or glass, and much smaller than traditional light sources, LEDs are a radically different way to produce light and as such, have much different properties than the traditional light bulb. Because of the efficient way in which LEDs convert electrical energy into radiated light energy, they produce many more lumens per watt than traditional incandescent bulbs. This gives the LED the ability to be applied in low power applications where batteries and solar power are the primary electrical power sources, to improve the operational time of these limited power reserves without a reduction in light output. Additionally, this high efficiency allows energy consumption to be drastically reduced in normal lighting applications through the use of LED fixtures which produce the same amount of light, yet use up to ¼ the amount of power as their predecessors. LEDs produce light in a specific wavelength that can be altered by changing the materials used in the construction of the LED. This allows manufacturers to produce application specific light fixtures, general light fixtures with “cleaner” light output, and special purpose light fixtures that do not require additional lenses or filters. With traditional incandescent and HID lamps, a filter or lens is required to alter the light output to the desired wavelength. For example, to produce infrared light from an HID lamp, a special lens must be used which filters out visible light and only allows light energy in the infrared end of the spectrum to escape. As can be imagined, this is a very inefficient way to produce wavelength specific illumination, as much of the electrical energy consumed by the lamp is wasted as visible light which is filtered out. Additionally, coated lenses and filters introduce additional materials which can degrade over a relatively short period of time, introducing added parts replacement costs and even poorer efficiency. 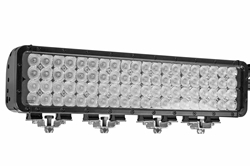 An infrared LED light bar such as the Larson Electronics LEDLB-200X2E-IR Infrared LED Light Emitter however, only emits light energy in the invisible infrared end of the light spectrum, allowing 100% of the light energy emitted by the LEDs to be used. LEDs have the unique ability to maintain color quality over a range of applied currents. When less current is applied to an LED, light output is reduced, yet the light created remains the same color. In contrast, an incandescent lamp loses color quality as electrical energy is reduced. Where a halogen lamp will produce a good warm light while operating at optimal current levels, reducing the applied current causes the light produced to shift to the yellow-red end of the light spectrum, effectively degrading the quality of the light produced. LEDs are an instant on light source. Unlike HID lamps, LEDs require no warm up period and reach full intensity immediately. In comparison, HID lamps start up at approximately 5-10% of their full power and on average require 10-20 seconds to reach full intensity. Additionally, if power to an HID is cut, the lamp will need to cool for a period before it can restart, which can cause problems in applications where uninterrupted light output is critical CFLs with which LEDs also compete, reach full power quickly, but cannot be cycled on and off frequently as this severely reduces their operational life. LEDs reach full power immediately, require no cool down period between cycles, and suffer no degradation in output or longevity from frequent on and off cycles. LEDs have no glass, gases, or filaments used in their construction. This makes the LED highly resistant to damage from impacts, vibrations and applications where abusive conditions are encountered ,such as in industrial or vehicle installations. Traditional light bulbs, be they HID, incandescent, or fluorescent, have a glass globe containing some sort of gas to improve longevity and light output. This glass is easily shattered if dropped, impacted, or water hits them while in operation, and some of these bulbs contain toxic gases that can escape when the lamp shatters. In industrial operations where special explosion proof lighting is mandatory, the possibility of shattering and exposure of the hot filament to flammable atmospheres can also constitute a fire or explosion hazard. LED produce little heat and have no glass or fragile parts, making them ideal for applications where a rugged light source is preferable. Aside from their excellent efficiency, LEDs have an extremely long operational life. Since there is little heat produced, no filament to degrade and no gases to be depleted, the LED has an operational life that can be anywhere from 25,000 to 100,000 hours depending upon the applications and type of LED used. The most commonly accepted averages place LEDs at 50,000 useful life hours, with about 70% of light production retained by that time. In comparison, incandescent lamps last only 700-15 hours, HID 10,000-25,000, and fluorescent lamps 10,000 to 30,000. Additionally, lumen retention for these lamps tends to be poorer than that of LEDs, leading to a noticeable loss of light output and quality well before actual lamp failure. Although initially more expensive, LEDs are rapidly decreasing in price. Despite this higher initial cost, LEDs already provide a cost effective alternative to traditional light sources due to their long life, low maintenance, and high efficiency characteristics. When considered over the long term, LEDs offer the ability to return their intial cost in as little as 1 year, and provide net savings thereafter that accrue over the entire life-span of the lamp, producing an overall reduction in costs. Although this is by no means a comprehensive list, as can be seen , the benefits of LEDs far outweigh those of traditional light sources for most applications.